Used Skoda Kodiaq Review - 2016-present | What Car? What's the used Skoda Kodiaq estate like? The Skoda Kodiaq is the Czech firm’s first large SUV and its first stab at a seven-seater. For large families on a small budget, it might just be the ideal transport, promising Skoda’s legendary value for money while delivering the practicality and flexibility needed by many SUV buyers. Even better, the Kodiaq shares some of its underpinnings with other well-established and deservedly popular Volkswagen Group SUVs, including the Seat Ateca and Volkswagen Tiguan. It sits on a slightly stretched version of their shared platform, with the overall length of the car being only 40mm longer than the Skoda Octavia family hatchback. 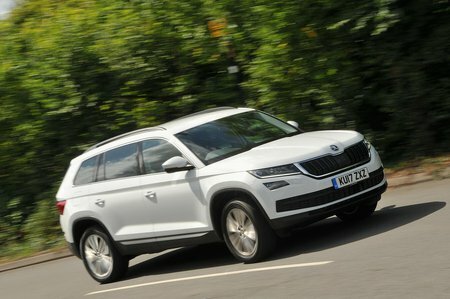 Despite that increased length, the Kodiaq is actually one of the lightest cars of its type, which helps both its performance and fuel economy. There’s a good range of petrol and diesel engines on offer, too, likewise all shared with other Volkswagen Group models. Most buyers so far have opted for the 148bhp 2.0-litre diesel, which is gutsy enough to haul around seven people with little drama and more economical when fitted with the DSG automatic gearbox than it is when specified as a six-speed manual. For those that need a little extra poke, Skoda offers the Kodiaq with a 188bhp version of the same 2.0-litre diesel engine, called the 2.0 TDI 190, although this does seem to be a little more expensive used and is obviously not as economical. While you might think the entry-level 123bhp 1.4 TSI 125 petrol engine would struggle in a car as big as the Kodiaq, it actually copes reasonably well, provided that you don't expect swift progress. But if you intend to drive long distances or frequently travel fully loaded with people and paraphernalia, the 148bhp 1.4 TSI 150 petrol is a better bet. It never feels underpowered and proves decently frugal in the real world. The 2.0 TSI is the strongest petrol option, but it’s a rare sight on UK roads because it isn’t particularly efficient and it’s rather pricey, even as a used purchase. Trims start with entry-level S, which is a little sparsely equipped and available with only five seats, rather than seven. Next-up SE trim makes more sense, because it provides dual-zone climate control, rear parking sensors, automatic lights and wipers, a decent infotainment system and cruise control. The SE L trim above that adds sat-nav and adaptive LED headlights, Alcantara seats, keyless entry and start and a powered tailgate. The upper trims, SE Tech and Edition, while fulsomely equipped, are a little pricey on the used car forecourts, so are best avoided. The Kodiaq handles well, with a surprising amount of agility for something so commodious, and it has plenty of grip. The steering is a little light at higher speeds, but this at least makes short work of lower speed urban motoring. It rides well, too, although there is a slightly unsettled nature to the car around town, over potholes and across road imperfections. It’s also pleasingly refined, regardless of which engine you choose. Wind and road noise are low around tow but up the decibels a little at higher speeds. But it's inside where the Kodiaq starts to flex its muscles. The driving position is excellent, with good visibility, and the dashboard and all the surrounding areas are full of soft-touch materials and well-damped switches, making it a pleasant place to spend time. There’s also a logical and easy-to-use 8.0in touchscreen infotainment system that comes with smartphone mirroring. Space up front is excellent, too, with plenty of room for the tallest of people, while the second row of seats will happily accommodate three passengers. The rearmost row has more than enough space for two children, and adults will be comfortable for short journeys. These seats fold away easily for increased boot space, and the boot becomes cavernous with all the rear seats folded down. Boot space in general is good, even though some of the Kodiaq's larger rivals offer a little more capacity.